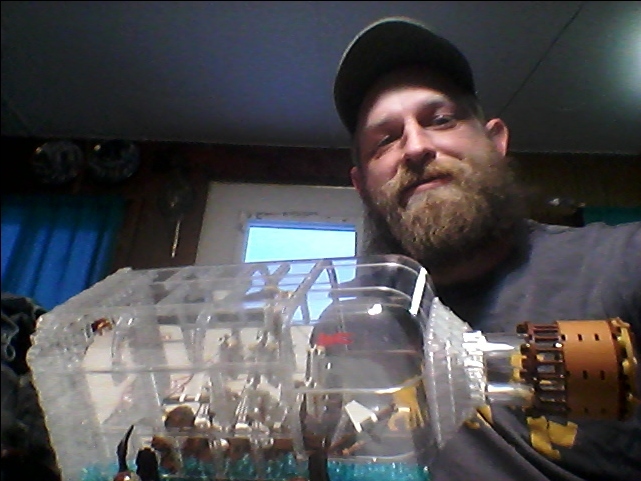 This week's 10K Club interview brings us to the USA, as we have the pleasure to introduce the builder of the uniquely shaped Ship In A Bottle, The Flagship Leviathan project, which took a short 48 days to accomplish its 10K goal. Please welcome its creator Jacob Sadovich, known as JakeSadovich77 on LEGO Ideas. It's certainly not every day that we see a transparent bottle built of LEGO bricks (some in the LEGO team even thought it was a glass bottle), so Jacob's challenges when designing this model were particularly interesting to hear about. Help us congratulate Jacob on joining the exclusive LEGO Ideas 10K Club! Scale models, refurbishing/building bicycles, reading, but mostly building with LEGO. ^ Jacob showing off his pride and joy! So long ago that I can’t even remember. 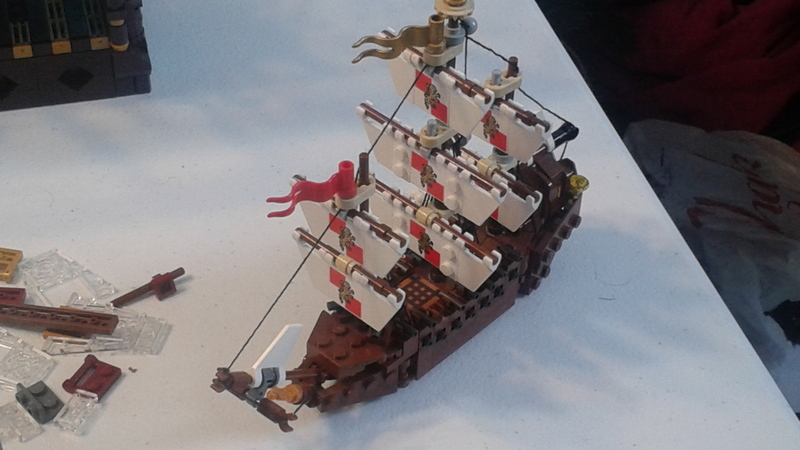 70810 MetalBeard's Sea Cow - because it’s awesome. 3839. It's my go too for "guns" on small minifig scale starfighters. Sadly, I must admit that I don’t know the names of all the official designers, but as far as fan designers I find Letranger Absurde to be quite skilled and wildly entertaining, also Corey Mitchell builds a mean castle, and my favorite trains belong to one Matt Pratt. 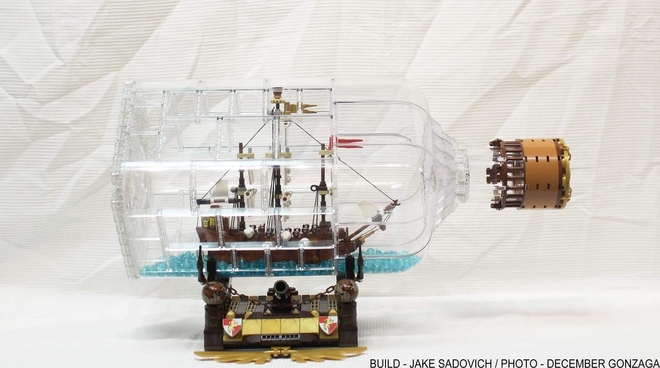 I constructed an actual ship in a bottle a few years ago. I started wondering around a year and a half ago if I could do one in LEGO bricks - bottle and all. The minifig snowshoes as pierce-work windows at the rear of the stern castle took around two and a half hours one evening and I just couldn’t get it to work properly so I gave up for the day. The next day at work I daydreamed about it all day trying to puzzle out a solution and had a couple ideas. I got home and it took about five minutes to finish. Just a few days ago as I was recreating it in LDD and I found a part that would work even better to support the snowshoes, so I finally figured it out you could say. Another rather tricky bit was the bottom of the bottle. I left it till last as I had no idea if I could do it or not. The problem with the bottle was the “color” trans clear, not a lot of plate size variations in trans clear exist. Also, in case it wasn’t difficult enough already, I just had to have a 10x10 dish in the middle to showcase my fancy pants stern castle windows. Why spend all that time on windows you can’t even see right? In the end I cobbled together a whole lot of 1x2s in conjunction with 2x2 boat studs and one 10x10 dish. Awesome and kind of strange, as there were several feelings all at once. Excitement at reaching the 10k mark, and in just 48 days, a great feeling of satisfaction that so many people liked my MOC, and gratitude that they took the time to support it and make this happen. Also a nearly palpable sense of relief that my short lived career as a human spambot on Facebook and other social media had come to an end and all these nice people could go about their business without me hounding them all the time. Just build the things that you enjoy building. I built this MOC just to see if I could. 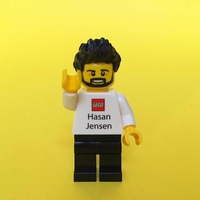 It was only after I posted it on Facebook and received a lot of positive feedback and suggestions that I submit it to LEGO Ideas that I even dreamed of submitting it, and here I am answering interview questions. There are several that I like. One that really sticks out to me is the Big Steam Tractor by Mr_Kleinstein. I really like some of the parts usage and color scheme, as well as the nostalgia of this older machine. I like the platform because it gives fans the opportunity to have their MOCs reviewed by actual LEGO designers and the potential to have their own idea produced as an official set. Other than my answer to question #1 of this section, I would suggest getting feedback from other LEGO enthusiasts before submitting.